Here is my photograph of the day: Koa, the bearded Ameracauna, and her dear friend Lilikoi, the Buff Orpington. Pele will be just out of view in the picture, but still close by. The three juniors are never far from each other. 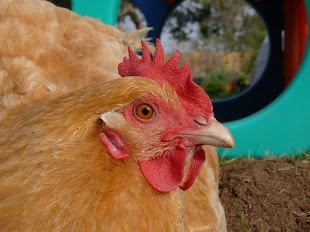 I still worry a rooster may be lurking in the flock, but so far the only crowing we hear comes from our old hen, Kamen. She's even taken to strutting like a rooster. It's quite a thing to hear and see. I am amused to think that if a neighbor asks, "Do you have a rooster?" and I reply, "No, we do not have a rooster," they are sure to believe I am a great-big-pants-on-fire liar! Tada! This clever little shelter has an eye screw inside and our feeder hangs under the shelter. It was affordable, and it is light weight. We can move it around. The slope of the roof comes down just enough so that I imagine only a stiff, horizontal gale would blow water into the feeder. As soon as I installed the new operation, we had nine hens giving it a try. Plenty of room, ladies, gather around! It was in the car when I picked Maria up from school, and she was excited, even before she knew what it was. She asked, "What is it?" I answered, "It's a food barn." She laughed and sounded thoroughly delighted, and exclaimed, "A Foo barn! He'll love it. Are we going to add walls?" Well, no. It's not a kitty Foo barn but I do love the idea. After the run got some sprucing, the goats brushed, the bunnies loved, the chicas admired, I got to enjoy hand quilting the Picnic Quilt. I've had a small break from hand quilting, since Mister Foo and Chango were alternating their nap times on my project. I've always made a point of being as consistent as possible with my stitch size and spacing... on other quilts. For some reason, I have been far more lax with this quilt, enjoying being free to make big or small stitches, and only aiming for doing what feels comfortable in the moment. When I first was learning how to quilt, a book I had for reference talked about making ten stitches per inch. Ten stitches per inch means making very tiny stitches! Not only does this require more stitches, but it calls for a more deliberate effort to drop the needle, down, through, and up again... whereas a wider spaced and larger stitch can sometimes be accomplished in a rocking motion, with the needle making several stitches at once. Knowing how much more work those ten stitches in an inch would require, I've never bothered... my fingers hurt enough as it is! But I have been curious, so around this one flower I gave ten stitches per inch a try. Some of the stitches are so tiny they are nearly invisible. Each stitch required the focused intent of bringing the needle in and out for each individual stitch. I can see how if my quilt were in a massive table height frame, like it might have been at a quilting bee, it would be easier to manage. If you follow this link, which I chose for the image of the quilting bee, you'll see an amazing example of hand quilting, with very fine stitching, indeed! It's lovely, but unless I can get five, or ten, quilting helpers to join me, and maybe some good thimbles, my quilts will be slightly less amazing. Geoff says his method would involve a long arm quilting machine! Alex thinks it's time to invent a quilting machine that can be run over the fabric, like an iron. I will not discourage either of them in their visionary ideals! And yet, I cannot imagine completely giving up on the happy meditation of a needle pulling thread. My favorite creative activity is hand quilting. I love the effect it makes. I like the food barn/foo barn, too. You are creating an ideal little farm. It's coming together. I can still think of some trouble spots, but we're getting there. I'm new to your blog but very curious...do you know why your hen crows? So funny! I have one who's grown spurs but no crowing so far. What can I say about our silly girl? I have read that in the absence of a rooster, some hens will step up and take their role as top hen very seriously. When she started, her crowing was absurd, almost like she was gagging. But with practice... well, she's gotten very convincing. Fortunately, she only crows some days, and only a few calls. Whereas roosters will crow any time of day, and often all day. Spurs, huh? Yeah, you may be hearing crowing soon, too. Very pretty! I like the idea of following the design with your stitches. Crafting is in the air (even the hot, humid air we are having today in NYC!). I just ordered yarn and a pattern from Quince. I saw the design, loved it and, after just a bit of research, made my decision in less than half an hour (which is super speedy for me!). Oh, and I love the new "foo" barn. Clever. I am not a speedy decider, either, especially when it comes to picking colors, fabrics, fibers. It's brutal how many beautiful choice we have! We need a cold snap, if we are going to keep our snuggly crafts and be comfortable! I hope you will share your project. Jennifer, your own project is progressing nicely, too. and wanting to know more.